I've been reading and hearing a lot about the "Iannuzzi APPR." To me, that's remarkable. Here in NYC, Michael Mulgrew couldn't wait to claim it. It was the best thing since NYC got rid of the last coal-burning furnace a few days earlier. I didn't believe it at all. Diane Ravitch has consistently said VAM is junk science, and to me, the optimal measure of junk science in my evaluation ought to be zero. Though both Iannuzzi and Mulgrew said this was a great thing because there was so much to be negotiated, I wondered about that. After all, having watched years pass without a contract, not to mention the one in 2005 that crippled seniority rights, I had a lot of reason for skepticism. For the last few weeks I've been traveling all over the state, and I've met union leaders who've managed to negotiate decent deals under this law. There are exceptions, of course, and we're likely the largest. Our leadership, for reasons that elude me utterly, thought John King, the reformiest man in the state, was a suitable arbiter between us and the fanatical ideologues that inhabited Michael Bloomberg's Department of Education. That's precisely the sort of judgment that keeps me from signing a loyalty oath to UFT-Unity. In other large cities, terrible deals went through as well, resulting in large numbers of bad ratings. 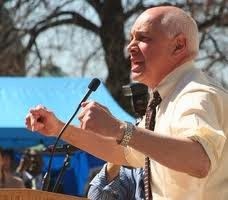 At some point, Iannuzzi angered the powers that be at the AFT. I have it on very good authority this is all about the endorsement of Andrew Cuomo at the AFL-CIO. While NYSUT's neutrality last time was not a problem, a NO vote from NYSUT would cost Cuomo the AFL-CIO endorsement. To be clear, Cuomo ran on a platform of going after unions, and there is no way on God's green earth he merits their endorsement or our silence. In any case, Lee Cutler, Maria Neira, and Kathleen Donahue declined to go along to get along. They, along with Iannuzzi, literally placed their careers on the line. To me, that speaks of character. It's a whole lot different from supporting mayoral control, Common Core, and VAM just because you've signed a loyalty oath to support any damn thing you're told. That's what we have in NYC. And if you don't believe it, ask Andrew Pallotta, the member of the board who spent the last year running a coup rather than working in our interests. He signed the loyalty oath, or he wouldn't be where he is today. I don't recall Pallotta saying one word against the APPR agreement when Mulgrew and Iannuzzi introduced it. For one thing, that would have been in abject violation of the Unity loyalty oath, and Pallotta is a former UFT-Unity District Representative. Pallotta's job in 2005 had to entail running around cheerleading for the disastrous 2005 contract, the one that reduced veteran teachers into wandering members of the Absent Teacher Reserve, a handy dumping place for teachers whose schools have been closed by Bloomberg. UFT failed to anticipate that Bloomberg's DOE would keep hiring teachers even as thousands of our members sat in the ATR. I love to teach. I would be miserable as a traveling ATR. The legislative branch of NYSUT is run by Executive Vice President Andrew Pallotta. Thought they're vocal on APPR, I don't hear a whole lot from his side about the Gap Elimination Adjustment that starves our schools, the tax cap that keeps localities from compensating for it, ever-rising tuition at state schools, or the complete sellout to monied interests in the Moskowitz Budget. They don't talk much about Pallotta sending NYSUT staffers to campaign for UFT fave Bill Thompson. Maybe Pallotta didn't realize NYC Mayor was not actually a state race. Maybe throwing a million bucks at Bill Thompson was not a great idea for the UFT. Moskowitz and her merry pals managed to buy Andy Cuomo for only 800K, so perhaps we could've outbid her. Who knows? Here's what I know, though. An Executive VP who jumps when Mike Mulgrew or Randi Weingarten whistles is going to keep doing so for the next three years, and is sure to pick running mates who'll do the same. Sure, it's fantastic to go over five years without a raise and have the worst APPR in the state. If that's the sort of model you favor, you ought to vote for Revive NYSUT. In fact, the only reason Iannuzzi and Stronger Together are being opposed is they've taken a principled stand against the "seat at the table" politics that have failed again and again in both city and state. And every one of the UFT-Unity chapter leaders who've signed the oath will have to vote for same old same old or face the traditional pariah status of those who've been shunned by leadership. I'm an acolyte of Diane Ravitch. I'm always amazed that my politics, favored by just about every informed UFT teacher, preclude my participation in union activities. I'm even more amazed that leadership can hawk crap programs like VAM, Common Core, and mayoral control and stay in. Of course, that may have to do with the fact that over 80% of working UFT members don't deem it worth their time or effort to fill out an X on a form. That's the UFT-Unity model, and that's the model that will be replicated statewide if Revive NYSUT wins. After getting to know him just a little bit, I couldn't agree more.